After Fritzanna Lyke retired from The Groves at the age of 67 she wanted to stay active. Many years earlier she had taught Sunday School at the First Baptist Church, and after retirement, just by chance, she ran into one of the children she had taught there. Her former student was all grown up and teaching First Grade at Fairmount Elementary School, and thought that Fritzanna would make a wonderful teacher’s aid. For the past four years Friztanna has been volunteering at the school, helping Kindergartners and First Graders learn how to master basic skills. She’s famous at the Fairmount School for the crocheted headbands she makes for her students – custom made for each student in their favorite colors. Every Kindergartner gets a headband. 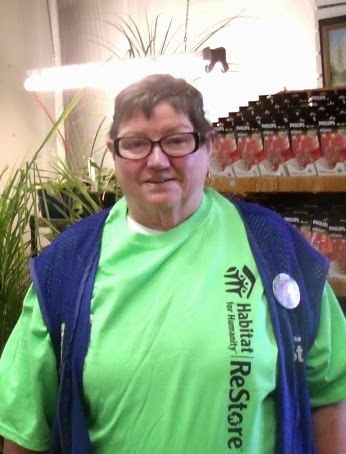 Three days a week she volunteers at the school, and for the past three years she has spent two days a week she helping out at the Habitat for Humanity Re-Store at 505 North Dodgion in Independence, where her husband James is also a volunteer. James, who Fritzanna married 37 years ago, is also retired and devotes his time to helping others. "We call it volunteering," he jokes, "but other people might call it ‘Community Service.’" James spends his summers on his riding lawnmower (he calls it a tractor) cutting grass for homeowners who are unable to. Every Sunday the Lykes work with children at Northeast Baptist Church, 9412 E Independence Avenue, where five vans bring 65 children from Independence and Kansas City for Sunday School. The children are fed lunch before an afternoon session, when they are encouraged to bring their school homework. Fritzanna and the other volunteers are able to help them complete their assignments and master any skills they may need help with. Fritzanna and James decided this year to start a community garden in a vacant lot they bought on Independence Avenue. This year they had ten planters growing vegetables, and hope to expand on that in 2015. Our community appreciates their service!